Many workplaces that encourage a pet-friendly environment see massive benefits. At Petinsurance.com.au we can certainly vouch for this. While we understand that there are a number of factors to consider such as your organisations particular circumstances, hazards or any allergies and dislikes of animals in general, we’re convinced the following pros list outweighs the cons. Relieves Stress – In our twenty-first century world where employee burnouts and mental health issues are more prevalent than ever, businesses are increasingly looking for ways to improve employee well being and increase overall job satisfaction. According to animal experts, individuals who bring their pets to work had decreased hormonal stress levels when compared with those who did not. Dogs and cats are actually so good at relaxing us our blood pressure lowers and our brain releases more feel-good serotonin. 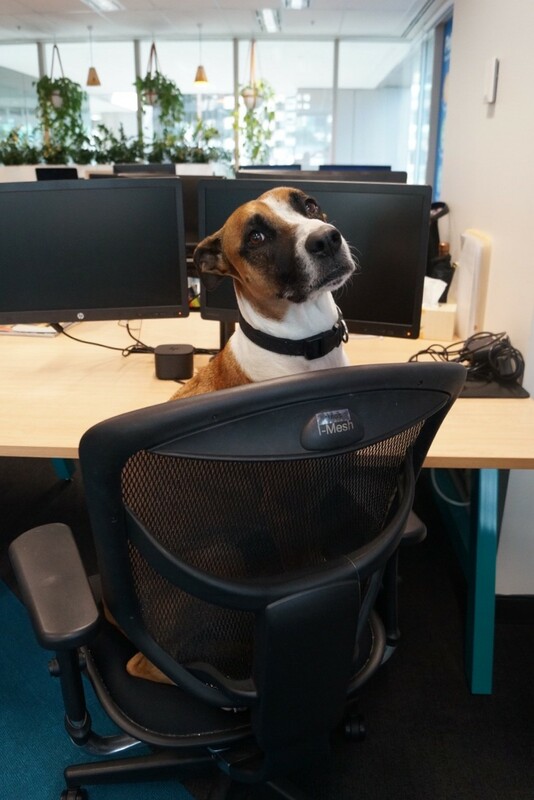 Greater Camaraderie – One of our own employees who brings their pup to work twice a week says “people will ask to come and see her and find out where you sit. You end up meeting so many different people in different parts of the business that I probably wouldn’t see much of otherwise!” Research supports the idea that pets in the office can break down the barriers of communication between strangers, improve feelings of community and encourage employee collaboration. Boost Productivity – Those with pets at work will be encouraged to take breaks and go for a walk with them at lunch time. Walking and regular breaks are an excellent way to increase productivity, efficiency and even creativity. 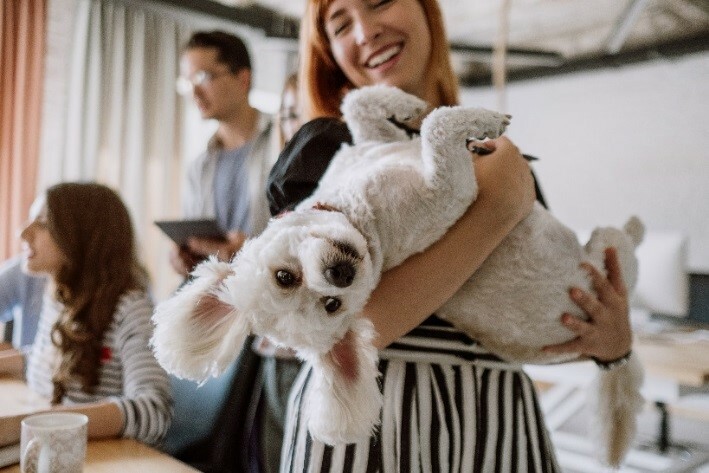 Lower Employee Turnover – With pets present, the working environment will more likely be viewed as a home away from home, promoting a healthy work-life balance and developing a willingness to work longer hours. Moreover, pet parents won’t be rushing home to their companions at the end of the working day. It also means employees get to save more, with pet day services these days being pretty pricey. Attracts new talent – People want greater flexibility in their lifestyle and therefore are attracted to the types of workplaces that offer culture-based perks, such as animal-friendly offices. 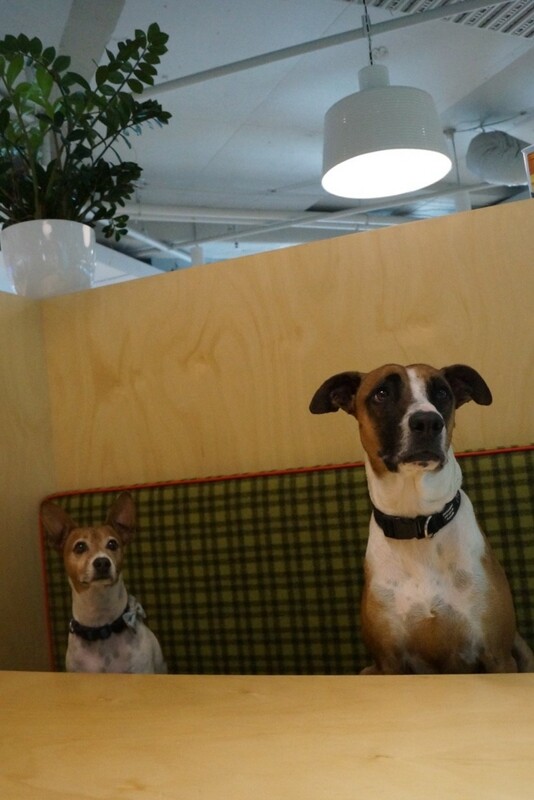 You’ll suddenly find your company becomes the place to work once your office becomes pet friendly. Do you need any more pawsuasion to bring your pet to work?